Lady Minerva Sharpe has the perfect plan to thwart her grandmother’s demand that she marry by year’s end: become engaged to a rogue! Surely Gran would rather release her inheritance than see her wed a scoundrel. And who better to play the part of Minerva’s would-be husband than wild barrister Giles Masters, the very inspiration for the handsome spy in the popular Gothic novels she writes? The memory of his passionate kiss on her nineteenth birthday has lingered with Minerva, though she has no intention of falling for such a rakehell, much less marrying him! Little does she know, Giles really is a covert government operative. When the two team up to investigate the mystery behind her parents’ deaths, their fake betrothal leads to red-hot desire. Then Minerva discovers Giles’s secret double life, and he must use all the cunning tricks of his trade to find his way back to her heart. The hellions have all been given an ultimatum. Their beloved grandmother has had enough of this strong willed bunch and their shenanigans. They must each marry by year’s end or forfeit their inheritance. Two are now happily wed much to their surprise,and Lady Minerva has devised a plan thwart her grandmother's plans. She advertises for a husband in the chronicle hoping she will cry off. What she doesn’t anticipate is Giles Master applying for the position. He is the man who in one moment gave her the best kiss of her life and in the next broke her heart. He is also the inspiration behind her fictional character in the highly popular Gothic novels she writes. The tale that unfolds was absolutely delightful and had me completely captivated. I adore the characters Jeffries has created with this unique family and was anxious to get Lady Minerva’s story. She is witty, and doesn’t take any grieve from her overbearing and protective brothers. She writes Gothic novels and is quite good at them. This makes her passionate and headstrong qualities I love in a heroine. Her weakness is Giles Masters and she deals with him like I imagine a lot of writer’s do, by weaving him into her stories. Giles' is smexy, dangerous and not at all like the image portrayed by his peers. His reaction to Minerva and his convoluted ideas about love, marriage and trust made this tale and their interactions delicious, suspenseful and at times annoying. He is smart and logical and skilled at his chosen career but has a few loose nuts when it comes to relationships thanks to his past. The Hellion brothers and grandmother were ever present and added to the tales humor, suspense and mildly addictive angst. Jeffries' tale is well paced, filled with twist and turns that kept me flipping the pages. I read this in two non-stop sittings and found myself laughing, intrigued and swooning as the heat between them was turned up. We see some advancement in the overall series ARC and I cannot wait to learn more. We glimpse the other siblings, and at times they created angst which was delightful. The Grandmother is so clever and she really allows the siblings to fall into their own webs and I adore her. The banter, heat and unfolding of Giles and Minerva’s romance was perhaps my favorite thus far. The chemistry, history and their personalities meshed making it feel genuine and believable. We get hints about the unwed sibling’s stories that are yet to be told and as I closed the book with a smile I found myself looking forward to the next book. Fans of romance, suspense and particularly Regency romances dealing with families will adore How to Woo a Reluctant Lady and the Hellions of Halstead series. The next books in the series are To Wed A Wild Lord and A Lady Never Surrenders, followed by a Christmas tale; 'Twas the Night After Christmas. My plan is to finish up this series by November and read the Christmas tale in December. Look for my reviews here. Your 3 word review is spot on! This book definitely was funny, smexy, and suspenseful :) This was actually the first book I read by Sabrina Jeffries and it, along with the other book in the Hellions series, are what got me to become a fan of the author. 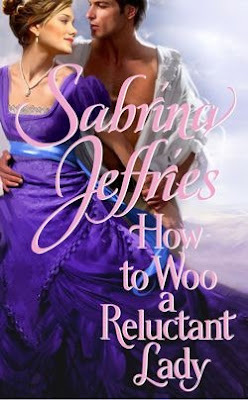 And How to Woo a Reluctant Lady is still one of my all time favorite romances. I so love this series! I am still waiting for a cheaper copy of the sixth book. You've been getting me in the mood for some historical romance! I don't have any in my review pile though, and I really need to be working on that, so it'll probably be a bit until I can read one. But hopefully soon'ish! I'm glad that you enjoyed this. Jefferies sounds like a wonderful writer, lovely review. This is the only book out of this series that I've read. I really enjoyed it and so need to pick up the rest. I so agree with you... had fun with this one as well! thanks Jenea..hope you and the family have a wonderful weekend! Well I am glad I am getting you in the mood, this is a really fun, fast paced series. thanks Lisa it did, have a nice weekend my friend! I like when it as a thread that weaves throughout the series. ooh you love so many of the series that I do, will keep my fingers crossed that you pick up a copy on sale soon! You have to try her, they are perfectly paced, funny, smexy and ...ok I won't go all fangirl on ya but read one! Have a nice weekend Andrea! I did Nick, and I almost know when I open her books that I am in for a delightful escape. Have a great weekend my friend! Regency romances aren't heavy on historical deets and tend to be similar to contemporaries but in a historical setting with balls instead of bars! I hope you try one..you might be surprised! ooh yes you need to! I recommend her for the three of you to read and review! Have a nice weekend! *dances* Have a nice weekend Ali! Thanks Farrah and I can see this being one of my favorites in this series..i so love Minerva! Okay you've convinced me. I MUST read this. Great review, Kimba. I'm going to have to try this series. I enjoy the covert-agent trope! Well it looks like you really enjoyed reading this book! :) Great review!